In a comment below, Dava asked what I was working on now. 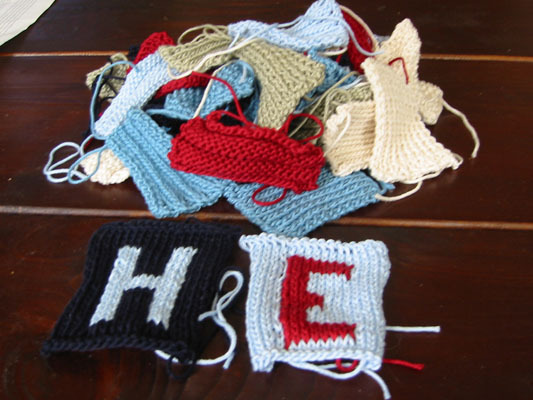 Some of you may remember the last set of baby blocks, and at the Knitsmiths on Sunday I was knitting the tiny swatches necessary for making this next set. So I'm asking for some help here. And because I am so committed to getting this right I'm willing to post pictures of *gasp* the BACKS of these squares. It's embarassing, but I'm a good tia and I want to get these squares perfect. 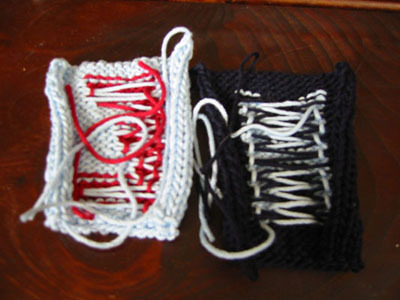 Shannon - what about doing it in stockinette and then using duplicate stitch to embroider the pattern on? Otherwise (and I'm not a color expert), it looks like you might need to catch the color a bit sooner as you move accross the row so that its not such a long spread. If you want to strand, you just need to leave more yarn in the float. Too jargony? Ack. Hope this makes some sense. It just looks like your floats are too tight. When you drop one colour, then work some stitches with the other colour, when you come back to pick up the first colour, spread your stitches out generously and then make sure you have a loose length of the yarn you're floating and continue knitting. It is a little finicky until you get the hang of it, but entirely doable to knit two colours and float the unused colour across the back. (Also if your float distance is long [more than an inch] you can just weave the unused colour with the used colour to tack it down and maintain your evenness for the float. hey shannon -- looks like everyone already told you just what i was going to say -- too long of floats -- letters like that are meant to be done intarsia not fair isle -- if you look at my knittin page i did a swatch for becky's blanket intarsia, i show a picture of the back w/ all the color bobbins, you basically make little bobbins of yarn for each area of that color -- so you would have two different bobbins of your background color instead of carrying it across... and btw, your chickami looks great!! Thanks for the advice, everybody! I took Terri's advice and stretched out the stitches on the right needle when picking up the first color after using the second color. 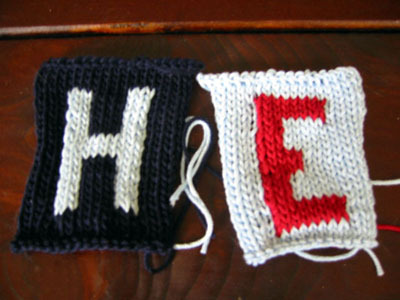 When I did an "R", I also took Tracy's advice of using two balls of yarn for the accent color so as to minimize the distance that accent color had to reach. Last night I blocked the block sides and wove in the ends. Now I'm in the process of seaming them, which I have to say is the most tedious part of all. I think that Monika was really on to something when she asked if I had considered picking up stitches and knitting the swatches directly to each other (rather than doing them separately and seaming them together), but alas, it's too late now. But with any luck, I'll have a picture or two soon!